In a trip to India at the end of May this year, philanthropist Bill Gates visited Ujariaon in Lucknow, Uttar Pradesh. Ujariaon is but one of hundreds of slums in India where the deprivation is staggering. About 2,000 people live in this one square kilometer and are sustained through garbage picking. The visit left a lasting impression on Gates. India may be progressing economically, but not all Indians are benefitting. Perceiving better opportunities in the cities, many who flock there end up in wretched conditions. Nevertheless, like anyone, Ujariaons want their children to be educated and believe that things will improve. 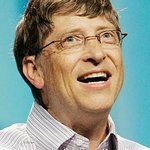 The Bill and Melinda Gates Foundation has already invested over a billion dollars in programs to fight disease and poverty in India. Gates says there are two reasons for that. The first is that “400 million people live in extreme poverty in India, more than in all 48 countries of sub-Saharan Africa combined,” and helping people live a healthy, productive life is one of the Foundation’s missions. The second reason is that India’s government has been an effective partner to the Foundation. Over the long term, India has often taken over the running and financing of joint projects. One of the greatest successes: In India there has been no new cases of polio for over a year. You can watch a video of Bill Gates’ trip here.